Although I was born in England, I have lived in the USA for many years. But there is something about many Americans’ backyards that leave me feeling uncomfortable. They don’t have fences. “Good fences make good neighbors,” as the saying goes. But I notice that many American neighbors seem to get along without them. Both my daughters live in Ohio, in homes on big lots. Out back is an expanse of lawn that blends seamlessly with the next-door properties. This has its advantages. Children can run free, and there are no awkward “can we have our ball back?” confrontations. But I always feel a bit exposed. I like my backyard to be clearly demarcated with a good solid fence or a hedge, or ideally both. That’s how they do it where I come from. Front yards in America often tell the same story. No walls or fences — just a stretch of lawns with a couple of trees and some individualistic landscaping here and there for variety. I think that’s better. In Britain we like to fence off our front yards, too — no matter how small they are. Even if it is just a patch of lawn the size of a small rug, surrounded by narrow flower beds, we will still often add a chest-high wall or hedge and a barred gate to seal it off from the outside world. The Englishman’s home is his castle, and any self-respecting castle has to have walls. Castles maybe — but churches? Churches, like British front and backyards, seem to like to separate themselves with walls. Congregations of different denominations in the same town, or even the same street, often have nothing to do with each other. Often the biggest hurdle to joint projects is just getting the local pastors and priests to sit at the same table. There are exceptions. I belong to our local Ministerial Association, along with ministers from Baptist, Lutheran, Presbyterian, Methodist and Pentecostal congregations. We get along pretty well, but we have to respect each other’s space. Perhaps that is the key. Denominations are like families, and they have developed their own ways of doing things. One Christian’s tradition may be another’s “heresy.” I don’t just mean major doctrinal and theological differences. It is often minor sociological variations that keep churches apart; things like speaking in tongues, clapping during the hymns or how they “do” baptism and communion. Those differences need to be respected. Eager evangelists urge Christians to “come out of our comfort zones.” So we should, but not all the time. A church is to some extent a refuge (that is, after all, one meaning of “sanctuary”), and if people who come there are always made uncomfortable, they will go somewhere else. Anglicans, Methodists, Catholics, Baptists, Pentecostals and other Christian churches are different, and they need places to be themselves. They need, so to speak, British-style backyards. But what about out front? Here is where we could learn something from the Ohio townscapes. 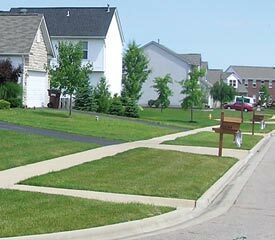 The open lawns and lack of fussy dividing fences turn what would otherwise be a row of houses into an inviting neighborhood. Why do Christians, who essentially believe the same things and face a common challenge, find it so hard to work together? Why should what others do to worship God pose a threat? Jesus prayed that the church be “one.” But that did not necessarily mean “one size fits all.” To work together with other Christians need not mean abandoning the traditions that make your church your spiritual home. So enjoy your spiritual backyard. 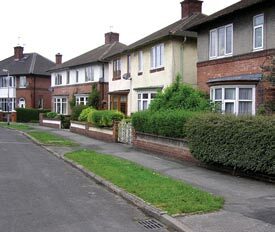 But at this time when the whole idea of Christianity is under threat, we need to blend our front yards into a more inviting neighborhood – even if people who visit do not end up knocking on our door. Is it not time that more of us knocked down some of those silly walls, and gave the hedge a severe pruning? We owe the world a better view of our beautiful Christian neighborhood. Is what those folks across the street do really so awful that you can’t work with them?